Visa aimed to raise awareness of contactless technology. 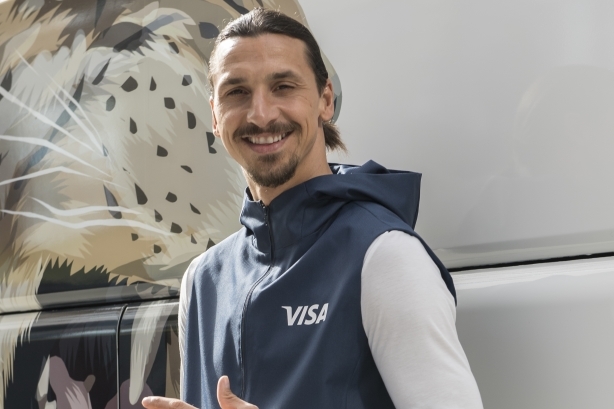 To fight World Cup fans’ FOMO (fear of missing out), Visa partnered with Swedish soccer legend Zlatan Ibrahimovic to create experiences for fans in Russia and those enjoying the tournament worldwide. Visa and its agency partners began planning for the campaign more than a year prior to this year's World Cup, which ran from June 14 to July 15. "With this FIFA World Cup campaign, we aimed to raise awareness of contactless technology and why paying with Visa is the best option when traveling internationally," explained Lynne Biggar, chief marketing and communications officer at Visa. "Visa’s biggest challenge was breaking into an incredibly sports-heavy conversation with authentic messaging around our efforts with [Ibrahimovic] and contactless payment technology." Visa decided to partner with Major League Soccer star and L.A. Galaxy forward Ibrahimovic, one of the most notorious international soccer personalities, who boasts 34.6 million Instagram followers. Ibrahimovic would serve as the celebrity spokesperson for the brand in Russia and help drive creative content. The brand also looked to use the campaign as a research opportunity to identify how consumers in Russia used the new contactless payment technology and upgraded thousands of point-of-sale payment terminals in Russia leading up to the World Cup. On April 17, Visa released the first of a slew of brand films featuring Ibrahimovic with a paid push on the brand's social channels, and Ibrahimovic’s social media pages. On June 14, Visa opened its Visa Everywhere Lounge in Moscow with a kick-off event featuring Ibrahimovic and Ekaterina Petelina, country manager of Visa Russia. The campaign team invited global media to attend the opening event, coordinating photography and b-roll crews to capture content at the event and distribute over global wire. The brand also launched another lounge for fans and clients in St. Petersburg. "The lounges were home to a number of interactive stations including personalized avatar creation, an AR game, local delicacy tastings, and a self-serve beer station equipped with best-in-class payment technology," said Biggar. A few days later, Ibrahimovic took to the stage at FIFA Fan Fest and touted Visa in front of a crowd of 25,000 people. On July 19, the brand posted a film focused on FOMO, featuring Ibrahimovic taking six Mexican fans who couldn't land tickets to a private box in the stadium to watch a match. Additionally, Visa partnered with a roster of four global influencers, who leveraged their social followings prior to and throughout the tournament. Influencers included: Freekickerz, a German soccer-focused social channel, Kotaro Tokuna, a Japanese soccer freestyler, Tatiana Vasilieva, a Russian style blogger, and Chris MD, a YouTube star from the U.K. The Visa World Cup campaign resulted in more than 1,500 articles and media placements worldwide, including features in Associated Press, Yahoo, and Hypebeast. The brand's partnership with Ibrahimovic led to a massive buzz on social platforms, with videos and GIFs posted to his Twitter, Facebook, and Instagram channels receiving more than 35 million views. Visa used the Everywhere Lounges in Moscow and St. Petersburg to host hundreds of the brand's clients and thousands of consumers during the World Cup. In addition, the brand revealed through research efforts that contactless payments accounted for 45% of all Visa purchases in the 11 Russian host cities.